Cast: Miyuki Ono, Aya Katsuragi, Hitomi Kobayashi, Eriko Nakagawa. With Japanese horror films now a regular sight in video stores across the globe, gems like Evil Dead Trap, long relegated to dodgy VHS copies belonging to the few individuals "in the know," have started to slouch into the sunlight. And a good thing it is too; there's more to entertain and bemuse in the 90 minutes of Toshiharu Ikeda's cult masterpiece than there is in any number of post-Scream slasher flicks. Television host Nami (Miyuki Ono), presenter of The Late Show, sends out a request for homemade videos from her insomniac audiences. Most of the stuff they receive is rubbish, but then a tape arrives that seems to show a woman's graphic mutilation and death. Sensing a decent story, Nami and her crew set off to find out where the footage was shot. This doesn't turn out to be such a good idea. The excessive gore and violence in Evil Dead Trap lead to the film's classification as a splatter movie, although there's a lot more happening here than the usual trawl from one bloodthirsty scene to the next. Perhaps the most interesting aspect of Evil Dead Trap is the welter of cinematic influences, both western and Japanese. The snuff-video theme recalls David Cronenberg's Videodrome, and the final 30 minutes are heavily influenced by Cronenberg's "body horror" concepts. The images on the video itself are equal parts Luis Buñuel and Lucio Fulci, reflecting both directors' interest in the human eye. The influence of Dario Argento is visible throughout the film, particularly his use of color and his preference for complex and brutal death scenes. Sam Raimi's Evil Dead films are the obvious source for the quick, ground-level tracking shots as well as some of the fog-bound woodland scenes. However, the tracking shots are presented in black and white and move through industrial wasteland, two overt references to Shinya Tsukamoto's Tetsuo. The snuff video is perhaps connected to the notorious Guinea Pig series, since at least one of those films has been mistakenly described as a snuff film. Evil Dead Trap is most definitely more than the sum of its parts, however. There's enough intelligence and talent at work here to combine these elements into something new and interesting, rather than just an assortment of references to other, more well-known films. Being realistic, Evil Dead Trap is not an entirely successful film. While it shows a desire on the part of the director and screenwriter to do something new and original, the final 30 minutes do not gel with the rest of the film, and are likely to leave many viewers scratching their heads. In keeping with Japanese horror as a whole, the film moves at a soporific pace that might well frustrate first-time viewers. There's no acceleration towards a climax, and the whole film ends rather abruptly. 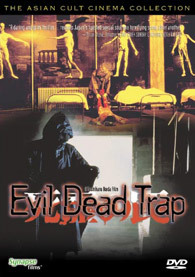 Nonetheless, Evil Dead Trap is an interesting and unusual film that should impress viewers already converted to the cult of Japanese weirdness, as well as more adventurous movie fans.